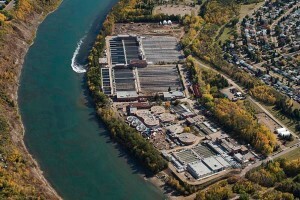 30 September 2014 – Edmonton, AB and Vancouver BC – EPCOR Water Services Inc. and Ostara Nutrient Recovery Technologies have partnered to build the largest nutrient recovery facility in Canada. The facility will recover phosphorus from the nutrient-rich wastewater stream from the Clover Bar biosolids settling lagoons located at the Edmonton Waste Management Centre and transform it into an eco-friendly, slow-release fertilizer, sold as Crystal Green®. The facility and process is being constructed by PCL Construction Management Inc. and Ostara at Clover Bar, where EPCOR discharges the biosolids produced at the Gold Bar Wastewater Treatment Plant, which it owns and operates. “Ostara’s process is a green win for EPCOR. Implementing Ostara’s nutrient recovery technology will help us reduce the amount of phosphorus that we are discharging to the North Saskatchewan River at the Gold Bar Wastewater Treatment Plant. As well, a reduction of phosphorus in our global system will significantly reduce the need to use chemicals to combat struvite build-up in our treatment system,” says Gavin Post, Project Manager. The nutrient recovery facility will feature Ostara’s Pearl® 10,000 and once fully operational in 2015, it will have an expected annual production of at least 2,000 tons of Crystal Green fertilizer. The Ostara Pearl® process will not only help the Gold Bar Wastewater Treatment Plant meet increasingly stringent phosphorus discharge limits into the North Saskatchewan River but will also help protect the local watershed. Excess nutrient discharge into surface waters contributes to eutrophication: the growth of algae and other aquatic plants, which can reduce sunlight and oxygen levels to the point where other aquatic life cannot survive. The facility will recover up to 85% of the phosphorus and 25% of the nitrogen from the Clover Bar biosolids settling lagoons, helping EPCOR to overcome build-up of struvite scale, a concrete-like mineral deposit caused by excess nutrients that chokes process equipment, increases operating costs, and undermines plant reliability. “Ostara’s technology is expected to provide us with greater flexibility in managing the liquid, nutrient-rich wastewater inventory at the Clover Bar biosolids settling lagoons and improve the performance of our entire wastewater treatment system,” added Post. Ostara’s process is expected to remove 245 metric tonnes of phosphorus annually. The recovered phosphorus – and nitrogen – will be transformed into a slow-release, eco-friendly fertilizer called Crystal Green®. The fertilizer, which is uniquely Plant-Activated™, releases nutrients in response to root growth, resulting in greater efficiency, lower application rates, and reduced risk of nutrient loss through leaching and runoff. It will be sold through a network of fertilizer blenders and distributors growers in the specialty agriculture, turf and ornamental markets. “As operators of one of the most advanced recycling facilities in the world, we are always looking for technologies to keep us ahead of the curve. With the rapid growth of Edmonton’s population, we now have a tool to help us better manage the liquid level of the Clover Bar lagoons, and most importantly, play an active role in reducing the environmental impact of nutrient pollution in the North Saskatchewan River,” said Post. The nutrient recovery facility and process is currently being constructed by PCL Construction Management Inc. and Ostara, and EPCOR will operate the facility. EPCOR’s wholly owned subsidiaries build, own and operate electrical transmission and distribution networks, water and wastewater treatment facilities and infrastructure in Canada and the United States. The Company’s subsidiaries also provide electricity and water services and products to residential and commercial customers. EPCOR, headquartered in Edmonton, is an Alberta top 65 employer. EPCOR’s website address is www.epcor.com. Opened in 1956, Gold Bar remains at the forefront of wastewater treatment technology, and is considered one of the most innovative wastewater treatment operations in North America. It is one of Canada’s largest Class IV wastewater treatment facilities, and on average, treats 255 million litres per day, which is more than 100,000 million litres annually – enough to fill an Olympic-size swimming pool more than 110 times a day. Vancouver-based Ostara helps protect precious water resources by changing the way cities around the world manage nutrients in wastewater streams. The company’s Pearl technology recovers phosphorus and nitrogen at municipal and industrial wastewater treatment plants and transforms them into a high-value, eco-friendly fertilizer, Crystal Green®. The process greatly reduces nutrient management costs and helps plants meet increasingly stringent discharge limits while improving operating reliability. Crystal Green is marketed through a global network of blenders and distributors to growers in the turf, horticultural and agriculture sectors. Its unique plant-activated mode of action improves crop yields, enhances turf performance and significantly reduces the risk of leaching and runoff, thus protecting local waterways from the nutrient pollution. Ostara operates facilities throughout North America and Europe and recently partnered with the City of Chicago to build what will be the largest municipal nutrient recovery facility in the world when launched in 2015. The company is the recipient of numerous awards including a World Economic Forum 2011 Technology Pioneer, the Global Cleantech 100 and Deloitte’s Technology Green 15. For more information please visit www.ostara.com and www.crystalgreen.com.